Choose such kitchen flooring that is comfortable, resistant to stains, low maintenance and a high degree of food traffic. 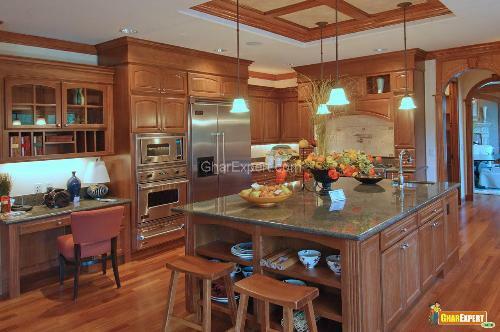 Hardwood kitchen flooring lasts long if you will take care of it properly. You can make your hardwood kitchen floor clean by using special wood cleaner. When you fed up with hardwood kitchen floors or they may get faded, then don’t take it as a serious problem. You can solve this problem by simply refinishing or staining the hardwood floor. Now hardwood kitchen flooring is available in urethane finishes so that they can stand to water and high traffic. The urethane finishes make the hardwood kitchen floor resistant to stains and there is no need of stripping, buffing and waxing. When you wish for durable kitchen flooring, then go for limestone kitchen flooring. It is a choice of the today due to the availability of stone in subtle patterns, pale, neutral colors. It is a type of marble flooring. You can choose it as it possesses hardness and low porosity features. Limestone kitchen flooring gives a stunning look to your kitchen interior. The properties of limestone such as durability and oil resistance make it highly popular among the kitchen flooring options. If you are not supposed to limestone seal properly, then it can get stains and you have to face lot of problem for its maintenance. This is the most preferable choices of the homeowners, architects and designers. 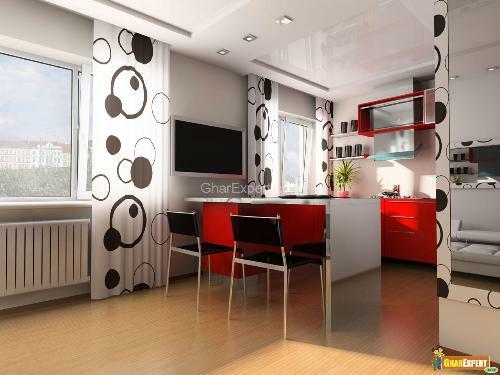 A wide range of colors are available in the market such as black, white, brown, gray and yellow etc. For pure limestone, choose white or off-white colors. So give your kitchen a unique look with limestone kitchen flooring. If you want to add character and depth to your kitchen, then you can use limestone countertops that look practical and great. Limestone marble kitchen flooring is adaptable to any atmospheric condition such as freezing and melting conditions. As limestone kitchen flooring is hard and durable, so you can use it for the long run. Low porosity and oil resistance are the other properties that will make the limestone kitchen flooring popular among the homeowners, architects and designers. Limestone kitchen flooring is soft and has non-slip surface that can be easily stained. You can make your kitchen fashionable by using floor tiles and the tiles give you the desired effect that you ever want in your functional kitchen. For a perfect look, you can match or contrast the kitchen flooring tiles with the walls, work surfaces, ceilings and lightings. Ceramic kitchen floor tiles are striking and have easy maintenance. These tiles are available in various designs and colors. You can install ceramic tiles on a sub floor. Ceramic kitchen floor tiles are cold as well as expensive. You can hire a professional to install the ceramic kitchen floor tiles in a perfect way. They run for a long time. If you can’t afford a lot of money to install kitchen flooring, then linoleum kitchen floor tiles are the best option. There is no need to hire a professional to install the linoleum floor tiles. Linoleum kitchen floor tiles are available in different styles and designs. Some of the tiles look like wood floor tiles. Quarry kitchen floor tiles are expensive and large but they look best in large sized kitchens. You need a professional to install the tiles. Kitchen floor tiles are tough tiles but give your kitchen an effective look. 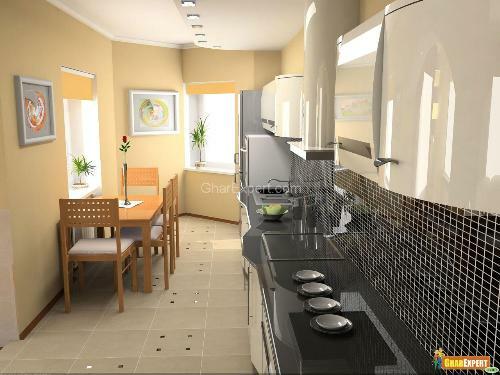 You can choose the styles of tiles according to your kitchen design. 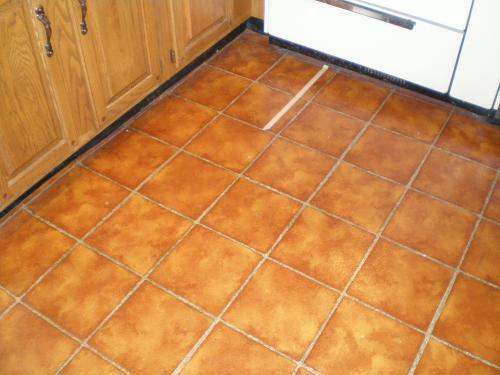 Kitchen floor tiles are available in both dark and light colors. But it is good to choose dark colored floor tiles as these tiles hide dirt and grime of your kitchen. Laminate kitchen flooring seems to appear as hardwood flooring. There are so many colors, sizes, and trends that are available in the laminate kitchen flooring. 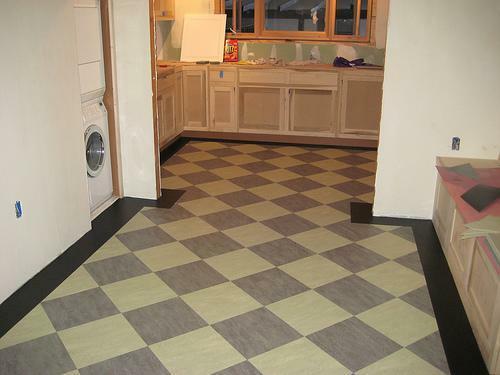 If you would like a checker board floor pattern in your kitchen, then you can mix two different colors in the kitchen. Laminate kitchen flooring is generally available in planks with several layers. To display the pattern and look of the laminate kitchen flooring, the first layer of plank has provided with apparent solid covering. Then maker fuse two layers together utilizing a high density core. To make the laminate kitchen flooring tough and moisture enduring, the backing will be placed on the plank. Laminate kitchen flooring is resistant to both food and dirt stains as well as moisture. So you can easily clean up the stains. 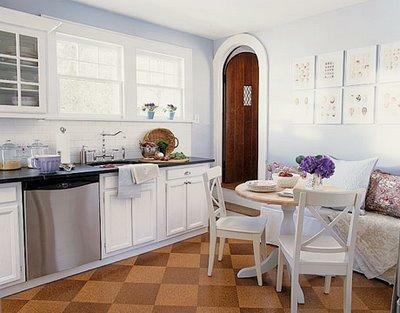 Vinyl kitchen flooring has become popular among the kitchen flooring. It comes in various colors and in thousands of patterns. You can easily maintain the vinyl kitchen flooring and it is easy to stand on vinyl flooring for a long time as it consists of soft material. Although vinyl is long lasting but it may get peeled. But the problem with vinyl kitchen flooring is that it is susceptible to water damage. Linoleum kitchen flooring is also popular among the kitchen flooring. Easy cleaning is one of the important features of linoleum kitchen flooring. But the con of linoleum kitchen flooring is that it is susceptible to water damage. This flooring offers you an environmentally friendly atmosphere and looks appealing in your kitchen. In modern times, there is a fashion to install earth-friendly kitchen flooring. 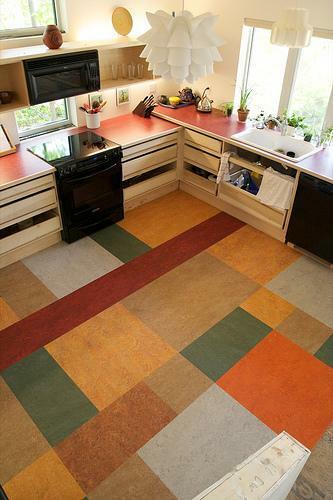 You can make your environment safe by using cork kitchen flooring. Cork kitchen flooring gives you the feeling of softness under your feet and may also prove a good sound barrier. Actually, the cork is made from the bark of oak trees, hence does not contain any artificial products. But it has short life span as compared to others kitchen flooring. 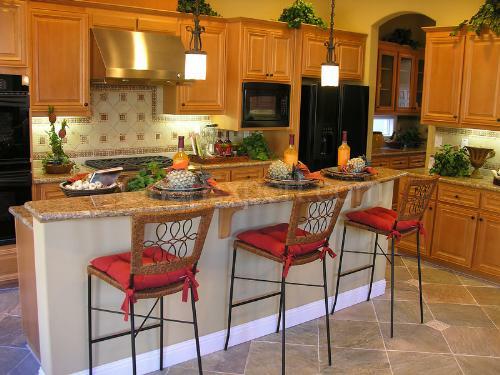 The maintenance of cork kitchen flooring depends upon the type of finish which you have chosen. If you have wax finished floor, then you have to require waxing at least once a year. In case of polyurethane finishes, you have to sweep your kitchen floors regularly otherwise they will get scratched soon. Bamboo kitchen flooring is also earth-friendly flooring. 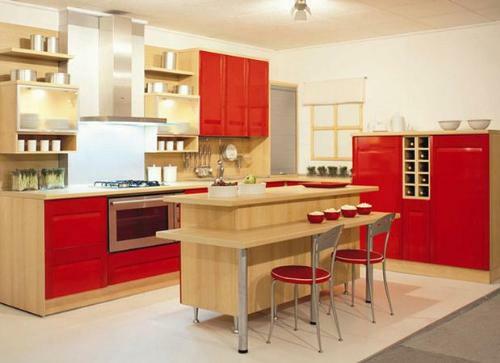 You can choose it for giving an appealing look to your kitchen design. The bamboo is available in natural colors of brown to tans and offers the beauty and grace to the kitchen floor. 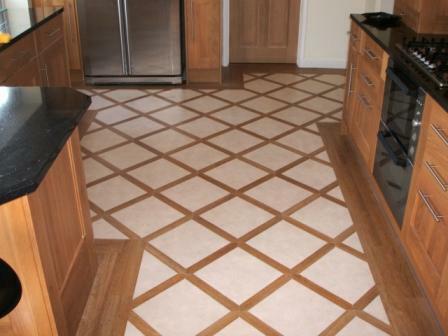 Bamboo kitchen flooring gives a visual depth to your kitchen floor and creates a spacious effect in your kitchen. It is hard as well as resists deformation. The maintenance of bamboo kitchen flooring is quite simple and you can do light mopping and sweeping to make it clean. For tile or hardwood kitchen floors, you can place carpets or area rugs that will save your kitchen floor from scratching. If you have kids or elder family members, then don’t install marble or waxed kitchen floor as there is possibility of their slipping. Regular cleaning of kitchen floors give you a sparkle and stain free kitchen that is admired by everyone.